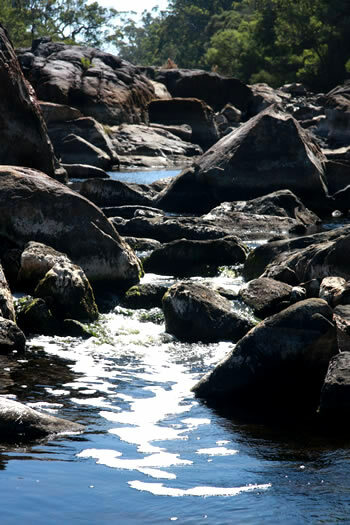 Circular Pool is a rock channel segment of the Frankland River. The name circular pool derives not from the shape of the two pools, but by the froth that is created by the falls which shows the water currents. The currents of the pools flow in circles, creating moving circular patterns with the foam they create. The foam is a result of saponin which is a class of chemical compounds found in plants. Saponin, when shaken (not stirred), creates the 'cappuccino' foam for which Circular Pool is famous. The foam actually gets stained by the eucalypt leaves in the water and looks like a cinnamon topping on the cappuccino-like frothy foam..
Circular Pool is a wonderful place to explore with easy access to the pool via a gentle, winding pathway and high quality, wonderful boardwalks and lookouts. It is 550meters from the carpark and toilets to the bottom of the pool with a trail classification of 2. 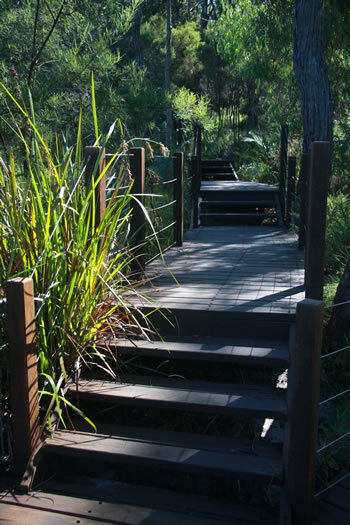 There are only a few steps which make it wheelchair accessible. 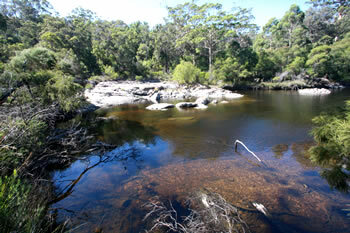 In summer the pools are still and the Frankland River at it's lowest. 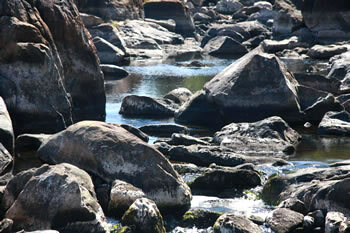 This is a good, safe time to explore the rocks at the riverside. Children love this place. 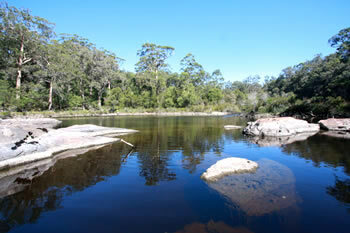 The mid-season flow of the Frankland River into Circular Pool is steady but shallow. 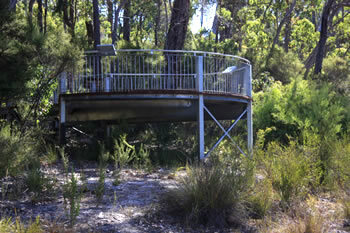 The walk is a beautiful, sealed, well kept pathway with two viewing platforms overlooking the river and pools. Perfect for children and elders alike. This makes visiting Circular Pool easy and fun for all ages. Be careful, wet rocks are very slippery. Always supervise your children. Your safety is your responsibility. Nearby, the Giant Tingle Tree offers a look at the world's oldest living eucalypt. 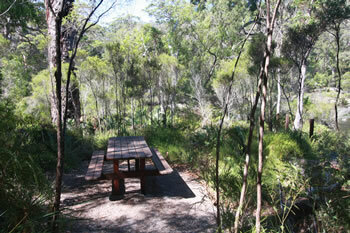 Walpole - Nornalup National Park is filled with Tingle, and is a wonderful woodland experience. Click here for a Map to Circular Pool. 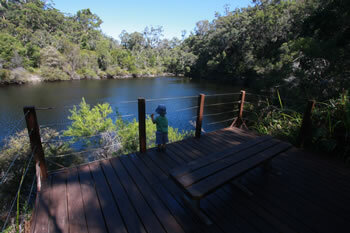 Circular Pool is a beautiful, tranquil place for the whole family. The bottom pool is deep.